Ricardo has to work hard to train, but his favourite go-to exercises are pull-ups. He also used to swim a lot, so his back is quite strong, along with his upper body. Dedicated to looking good, training hard and keeping healthy, Pamela is an inspiration. She is competing in her first body building competition in September in Birmingham. Pamela’s competition class is known as “Bikini” and there are a number of poses she has to do to show off her musculature. And all in high heels and a bikini! What inspired her to take part? “Victor, one of the personal trainers here introduced me to it, and he helped me to start the training. He knew that I had the dedication and drive to stick to the discipline to get the right physique. The hardest part is sticking to the diet!” laughs Pamela. Sporty Pamela eat, sleeps and breathes fitness and has done so all her life, so training hard for her competition seems a natural progression. “When I was younger I used to do athletics and I studied at the University of East London for sports science degree. I actually had two children to bring up while I was studying, they are now aged 26 and 24,” says Pamela. But working in the fitness industry after completing her degree was difficult, there were just no jobs available for inexperienced graduates. So, Pamela took up a job as a croupier in a West End casino – and ended up staying there for nine years! After that she had a normal 9-5 office job and worked her way up to be a Human Resources Manager. But the fitness bug was hard to shake off, so Pamela decided to retrain as a personal trainer, after volunteering at YMCA Surbiton. Inspirational stuff – but our gyms are not all about seeking perfection. They are friendly, caring and supportive places to work out, whether as a gym member or someone who attends our classes. Wanda has been coming to YMCA Wimbledon for 30 years, and originally started when she lived in South Wimbledon, coming to classes in the evening. She then moved to New Malden and used to come on the bus, and now her daughter brings her in from Esher. She has a daughter, two grandchildren and five great grandchildren. Working out and keeping fit and supple is something which Wanda has done all her life. Before she left Germany to come to live with her husband in the UK after the war, she trained as a professional ballet dancer in Cologne. The two Sarahs joined YMCA Wimbledon back in September 2015 and come to the gym to work out three times a week, plus they love the indoor cycling classes, too. “I’m trying to lose weight,” says Sarah Smadja, “so this is perfect for me. The staff here are great too.” “I love the programme I’ve been given,” says Sarah Medja. 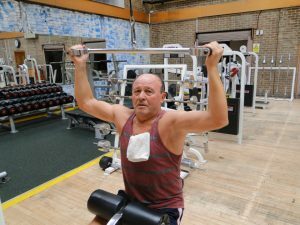 Victor is a resident at YMCA Wimbledon and goes along to the gym four or five times a week. He joined in December 2015 and has lost 5 kilos since then. “I feel so much better,” explains Victor. 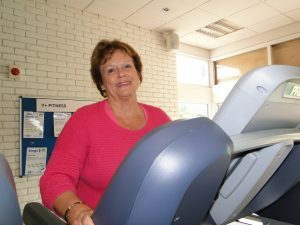 Betty joined YMCA Surbiton in February via GP referral, after suffering a back injury. She attends once a week with her daughter Susan. She has a tailored programme that helps her recover from her injury, and already she has begun to notice the difference. “I like the rowing machine and the bike best!” she says. She is a very active lady, particularly with her gardening, so is keen to be back to her old self again as soon as she can – she used to be a ballroom dancer, with a special interest in Old Time Dances. Nilanthi has been a member of YMCA Surbiton for one month. After a gastric operation, she was referred to the gym on a 12 week programme by Kingston’s Public Health team, to help her build up her strength. She completed the 12 week programme and was so impressed with the staff and facilities, she decided to join as a member. Her tailored programme is easy to keep to and she feels comfortable with it, and attends three times a week. “I love the range of equipment and I find the staff very helpful,” she says. Fin has been YMCA Surbiton for the last five years and is a student at Cardiff University. He lives locally when not at uni and comes to work out according to the fitness programme drawn up by his rugby club at university. “ I love the free weights and squat rack,” he says. Rachel Sharrod, instructor for the Public Health Get Active exercise referral programme.